I don’t know about your house, but at mine when it rains…it pours. This is one of those pouring weeks and it’s only MONDAY!!! We got the infamous 5 am phone call this morning telling us to go back to sleep because we had a snow day. Twelve fresh inches of the white powdery stuff that I’m not too fond of had fallen through the night. 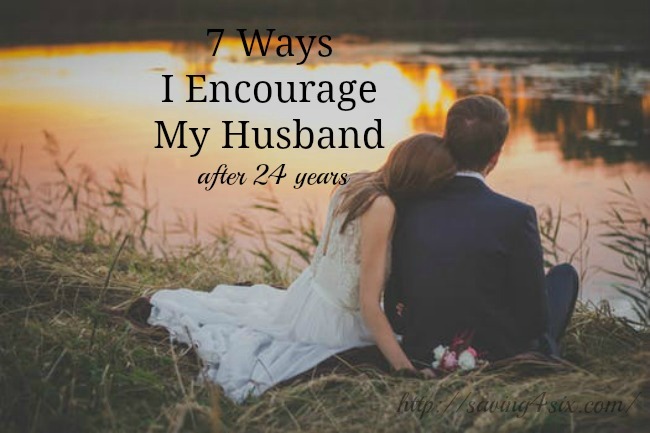 Things continued to be bumpy while I was sitting on the couch having my quiet time, a snowplow went by and hit our mail box sending it flying to the ground. Yep, pretty sure the mail lady won’t be delivering my mail today! Then I started my Monday morning laundry catch-up. After tossing the clothes in the dryer, I checked on them in about an hour and the dryer was cold…running, but cold. The clothes were all still wet. Ugh!! After another two hours of running the dryer with the same load in it, I came to the realization that the dryer was now broke. All of this happened before noon. Oh well, I’m trying really hard to not let it ruin my week or even my Monday. My Better Half is home from work now and has the dryer apart. I’m hoping he can identify and fix the problem without us having to buy a new dryer. The mail box is still sitting in the snow bank but that means I didn’t get any bills in the mail today and two of my kiddos got called into work at the ski slope because of the extra snow and snow day. So, I’m choosing to look for the good in all the crazies!! 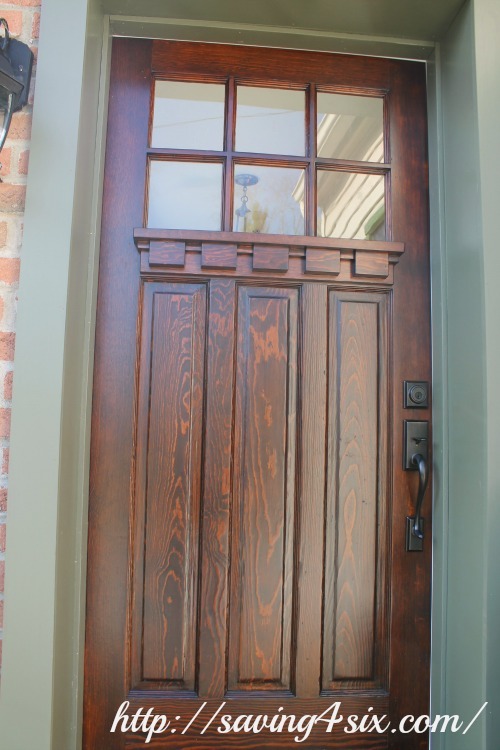 Anyway, none of that has a thing in the world to do with my new Craftsman front door but it IS a bright spot in all the little trials going on this week. 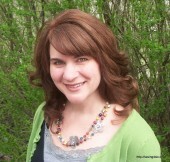 I’m SO thrilled with the results and have been eager to show you. I have been waiting until we had a nice, sunny day to take good pictures. If you know anything about NE Ohio, you probably know that a sunny day this time of year doesn’t happen very often. Last week, the sun shined down on us and I got some good photos, so brace yourself for the finishing touches and the gallery of photos. 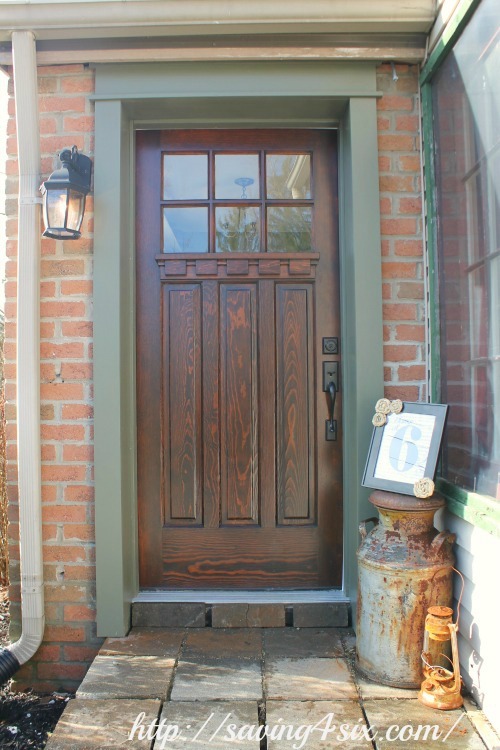 If you haven’t seen how all this started, I’ll give you a brief recap or you can check out Part 1 and Part 2 of this door project. 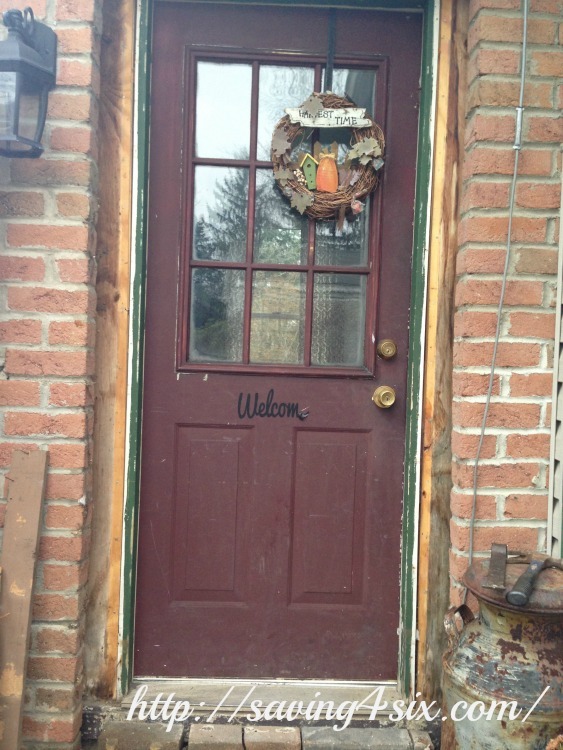 This door started with My Better Half seeing it along the side of the road for $15. 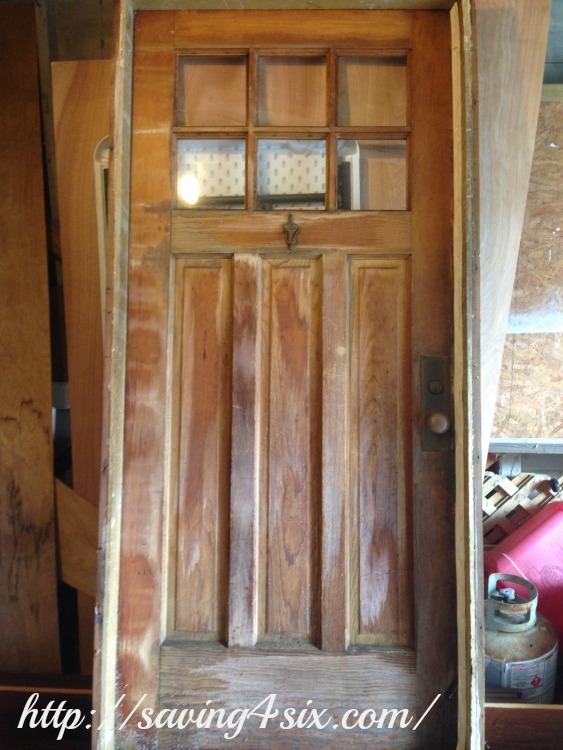 We sanded the door down and did some minor repair and strengthening. We added a dentil shelf and built a new frame. Next came the fun of staining. 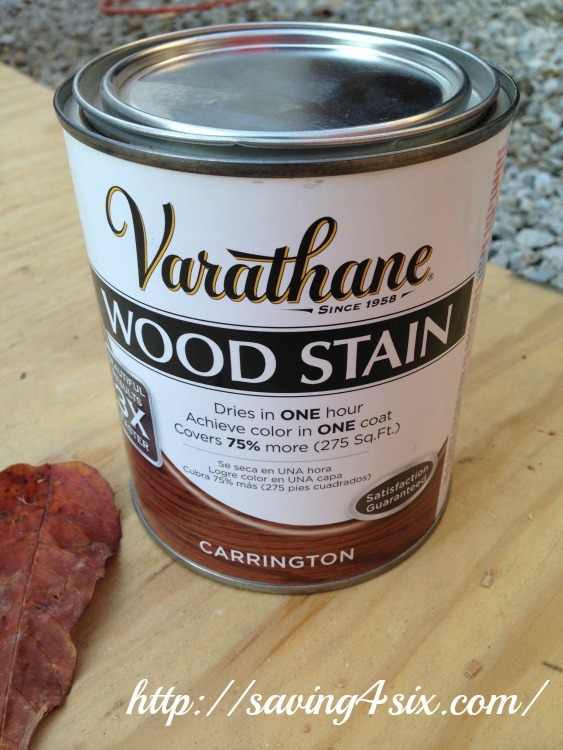 We chose Varithane Wood Stain – Carrington. 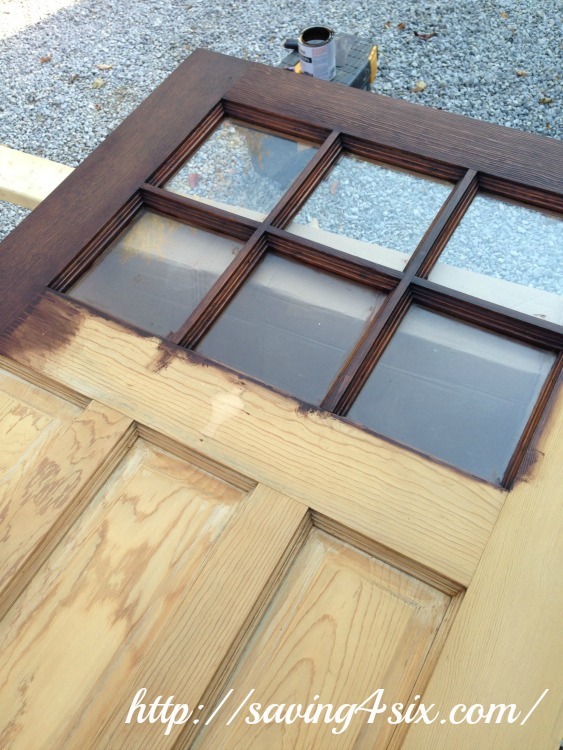 We applied the stain with a rag and used a small brush for the cracks and crevices. 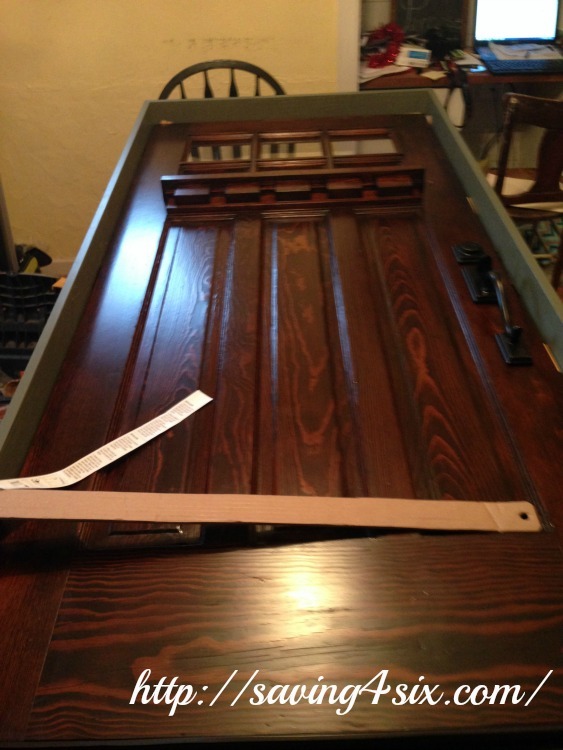 Because the door is an exterior door we needed to seal it so it would hold up under the elements. 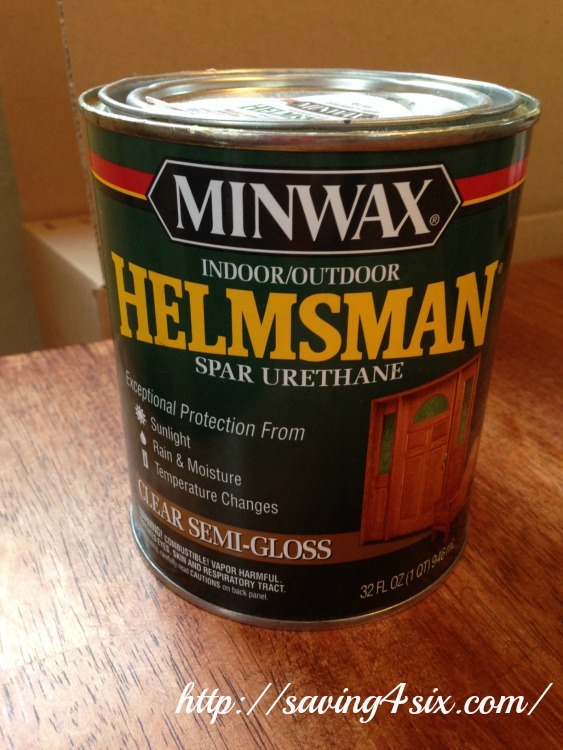 We applied approximately 4 coats of Minwax Helmsman Spar Urethane varnish. 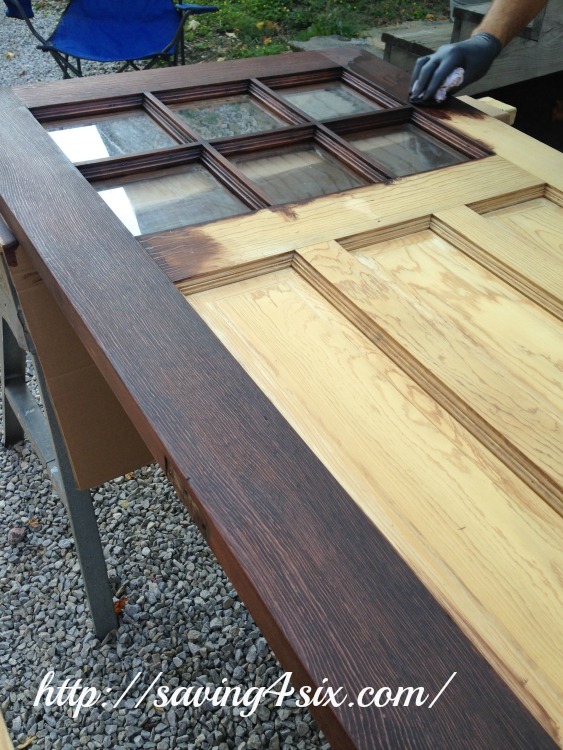 This added a beautiful glossy coat and did the job of sealing up the wood. 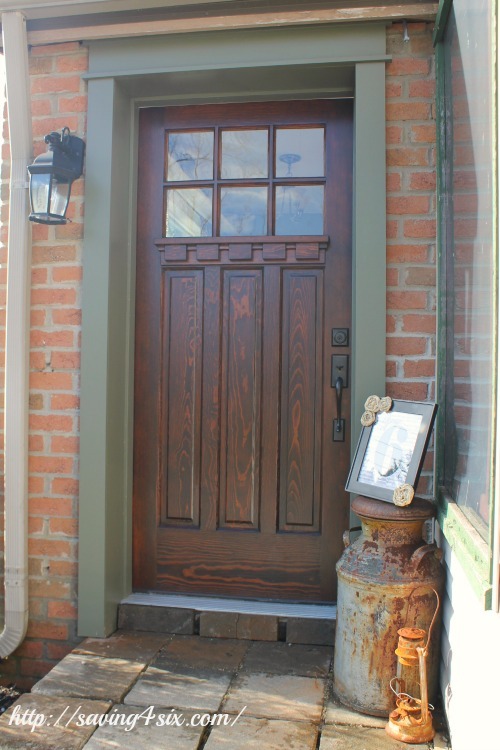 We built a custom door frame so it would be a perfect fit into the existing space. 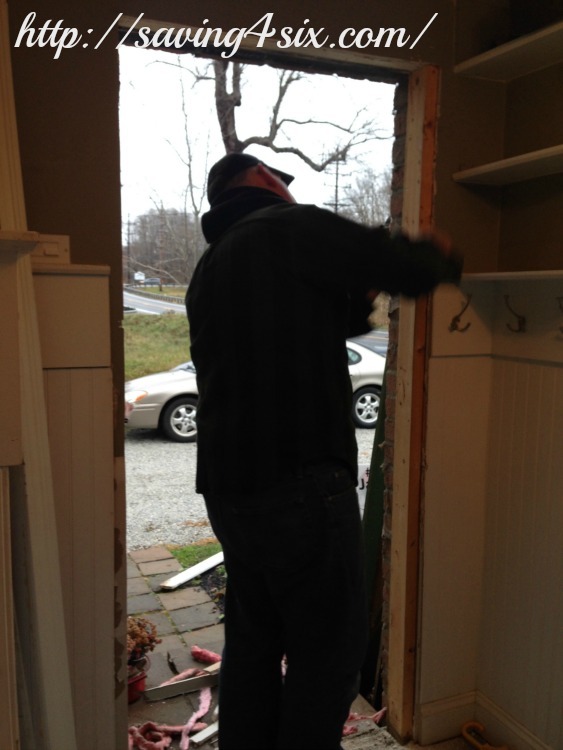 The next step was to remove the old door. 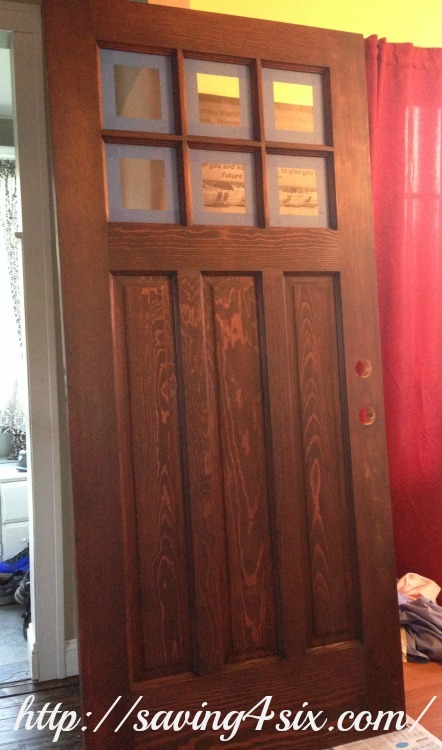 Now, I’m almost embarrassed to show you my old door. It was looking so bad and My Better Half took off the trim before I had a chance to grab my camera. You can see now how desperately we needed this update!! Not only did it look bad, it did not get a good seal and was VERY drafty during the winter. The dental shelf adds such a beautiful decorative touch. 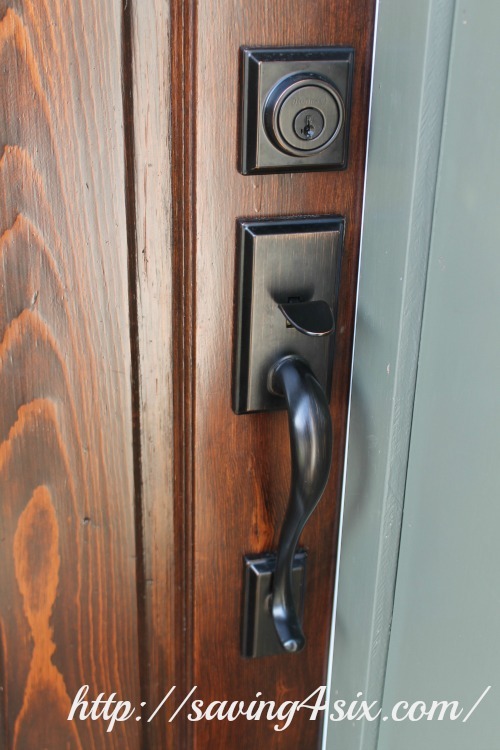 The hardware was from our local house depot store. It was in a box that was ripped. We asked if we could have a discount because the box was damaged and they gave us 20% off. Now I’m going to LOOK for the damaged box!! 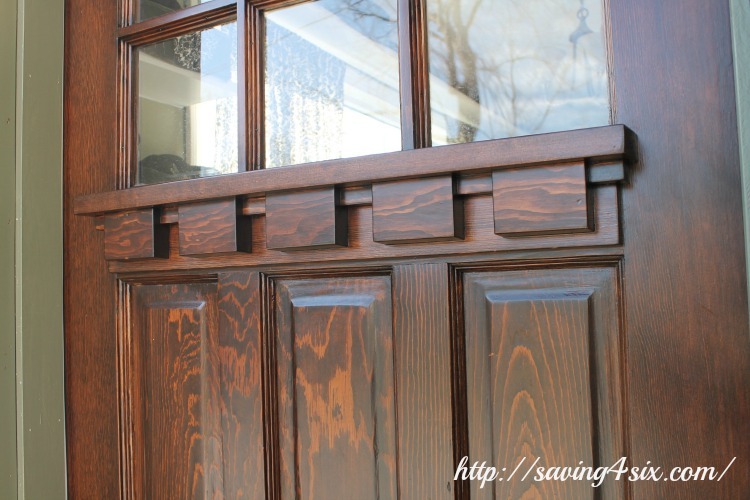 I really can’t say how much I love this door. 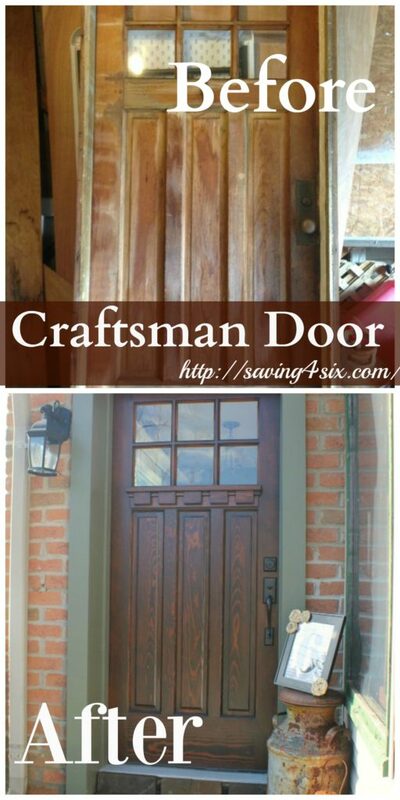 I’ve wanted a Craftsman-style door for years and years but it never quite worked to be in the budget. When My Better Half came home with this $15 roadside find, I could see the potential but I never dreamed how beautiful it would actually turn out. 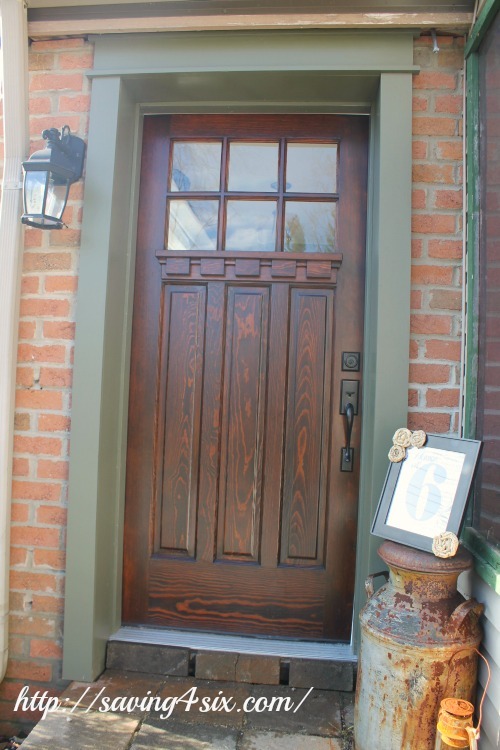 WOW your door looks so beautiful!! And if your like me I’m sure you like to drive past your house just to look at it. This is such a steal and an amazing reveal!! 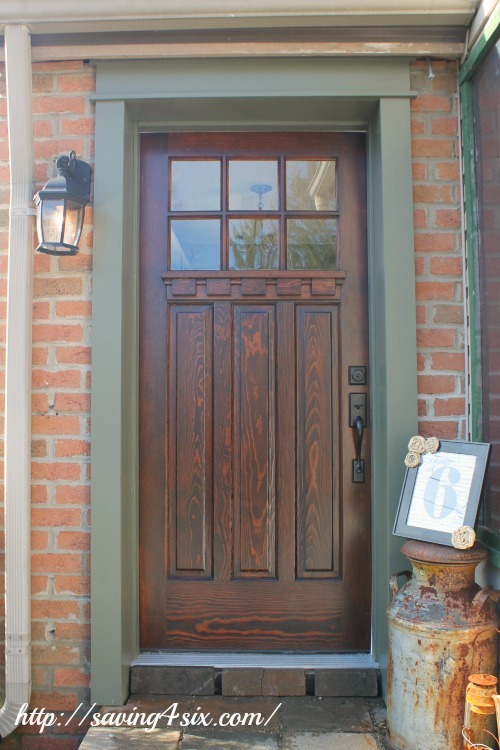 I have my fingers crossed to find a door like this at that price! I love how it turned out! Your work paid off…. it’s stunning. It’s so gorgeous! I’d love to see a picture that shows more of the house exterior to get the full effect! : ) Awesome job! I love it when old things get a second chance at life!